Slab leaks: they’re a big deal and a costly problem if left unresolved. But what are they exactly? At their most basic, slab leaks occur when water lines beneath the concrete slab your home stands upon leak—a far more complicated problem to address than pinhole leaks, which occur when pipes above the concrete slab leak. • Ground Shift: As the years pass, the massive weight of your home takes a toll on the concrete slab and the earth it was built upon. This eventually leads to settling and ground shift, and if the shift is significant enough, it will put pressure on your water lines. This pressure ultimately leads to cracking and leaks. Natural disasters like earthquakes can have the same effect—except the process takes minutes rather than years. • Faulty Wrapping: During normal use, your pipes (especially your hot water pipes) subtly expand and contract. If not for the wrapping that covers your pipes, they would rub directly against the coarse concrete, and over time this wear would lead to cracks and leaks. 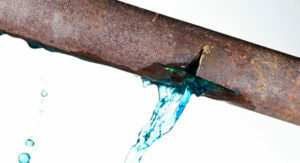 Unfortunately, pipes aren’t always wrapped properly, and where they’re vulnerable they eventually leak. • Nicked Line: Sometimes water lines suffer damage during installation or while workers lay the concrete slab. While that damage might not be significant enough to cause leaking during initial inspections, normal wear and tear over time can erode a small nick until it becomes a leaky crack. • Electrolysis: Chemistry at work! Electrolysis occurs when the copper in your pipes interacts with minerals in the soil beneath your home. This can cause a subtle electrical reaction that over time erodes your pipes until they leak. • Damp Carpet or Warped Flooring: Given enough time, your concrete slab will soak up water leaking below it. Once the concrete becomes saturated, the water needs to go somewhere, and that means up into your carpets and flooring. If you find damp (or soaked) carpet and you can’t explain where the moisture is coming from, you might have a slab leak on your hands. The same goes for warped wood or laminate floors. • Mold: Once water seeps into your floors, it then travels up your walls. Drywall absorbs water quickly and damp drywall generally leads to mold in the walls. • Smell: Wet carpet and flooring, damp and moldy walls: these things generally create a musky smell. Think damp basement. If luck’s not on your side and your slab leak involves a sewer line, you’ll smell something far more potent. • Yard Damage: Sometimes the leaky pipe resides under your yard rather than your house. This can lead to flooding in your yard, mushy patches of grass that never seem to dry, or ruined landscaping due to the constant up-flow of water. • Foundation Damage: The foundation your home rests upon is essentially two things: a concrete slab and steel supports. Slab leaks can lead to foundation shifts and cracks, which can show up as bumps or rises in your floor. As soon as you discover a slab leak—or even think you might have a slab leak—take immediate action. Each day you wait contributes to the damage your home will endure, and that means more repair costs down the road. Left unresolved long enough, your home might have severe structural damage in not just the foundation, which is serious enough, but the walls too. In such cases, windows can shatter due to warping of the walls and the window frames. Some people may think they can just do some research on the Internet and deal with the resulting water damage from a slab leak on their own. This is a dangerous conclusion. Please do not hesitate to call Ready Restoration for any Water-Fire-Mold Damage. They have a 24 hr emergency service and provide free estimates.